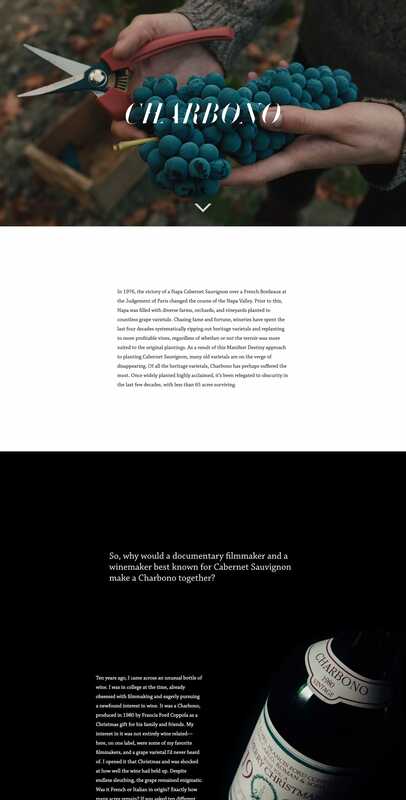 Long-scrolling One Pager telling the story of how a winemaker and filmmaker teamed up to create ‘Charbono’. The site features generous whitespace, clear typography and spectacular video production. Also a nice touch with the website footer styled as film credits. Would have loved the Shopify purchase page integrated into the main Landing Page but want to feature for an excellent reference to storytelling. So, why would a documentary filmmaker and a winemaker best known for Cabernet Sauvignon make a Charbono together?